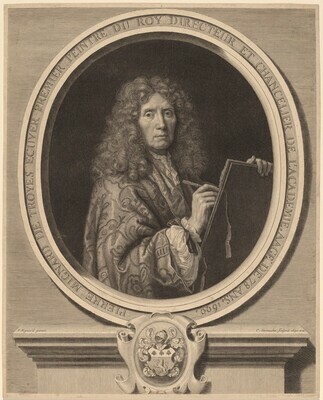 around portrait plate: PIERRE MIGNARD DE TROYES ECUYER PREMIER PEINTRE DU ROY DIRECTEUR ET CHANCELIER DE L'ACADEMIE. AAGE' DE 78 ANS. 1690.; lower left plate: P.Mignard pinxit; lower right plate: C. Vermeulen sculpsit 1690. et ex.